Welcome! This guide is intended as a brief introduction to using Bhagwadgomandal. For quick information, please see the FAQs. You can use Phonetic Keyboard directly to type in Gujarati. The overview screen will give you idea about how Bhagwadgomandal's homepage looks like and where to go from there! You can see most searched word so far and some showcase words to see richness of Bhagwadgomandal from homepage directly. We have explained Search Options in details below. Search Options contains four options - to get different types of desired results. This option will search for words starting from your query in Bhagwadgomandal. For example: If you are search "આ" as query, it will return result of words strating with "આ". This option will search for any occurrence from your query in Bhagwadgomandal. For example: If you are search "આકાશ પાતાળ" as query, it will return result of both "આકાશ" and "પાતાળ" words. This option will search exact as your query. Make sure that you have typed it correctly while using this option. Ever wanted to search ending with similar prass? Or want to find words ends with 'પાશ', 'વાન' etc? This handy option can help you in it. You can now search using wildcard characters like * and ?. The asterisk (*) usually substitutes as a wildcard character for any zero or more characters, and the question mark (?) usually substitutes as a wildcard character for any one character. For example: Searching 'પરીક્ષા*' will bring all results with words 'પરીક્ષા' as starting regardless any length, while searching for 'પ? ?ક્ષા' will bring result like 4 characters words starting and ending with 'ક્ષા'. When you search any word in Bhagwadgomandal, it will show you list of words. Select a word from list and it will show you final result. In result, you will find various sections like, ક્રમાંક, વ્યુત્પત્તિ, વ્યાકરણ and અર્થ. In અર્થ, you will show button 'Details'. Clicking on 'Details' will give you detailed meaning about that particular word. Turn off checkbox 'Phonetic Keyboard' if you want to write using your Operating System's keyboard layout. You have already noticed that when you try to write even keyboard is set to English, Bhagwadgomandal will type in Gujarati - This will be default behaviour of site searchbox. This is called 'Phonetic' keyboard layout. Onscreen Keyboard provides you easy way to write in Gujarati. Just click on character and it will type in textarea. To see keyboard in action in example, click here . You can view article about Bhagwadgomandal on Wikipedia too. Bhagwadgomandal is the biggest and the most prolific work in Gujarati. Visionary Maharaja Bhagwatsinhji of Gondal gifted the original Bhagwadgomandal to the world after 26 years of scientific and detailed work. Till date, this encyclopedic dictionary remains a cultural milestone of Gujarati language. Learn more about Bhagwadgomandal's rich History on our History page! 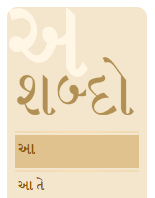 Welcome To Ratilal Chandaria's GujaratiLexicon - The Most Comprehensive Online Gujarati Language Resources. 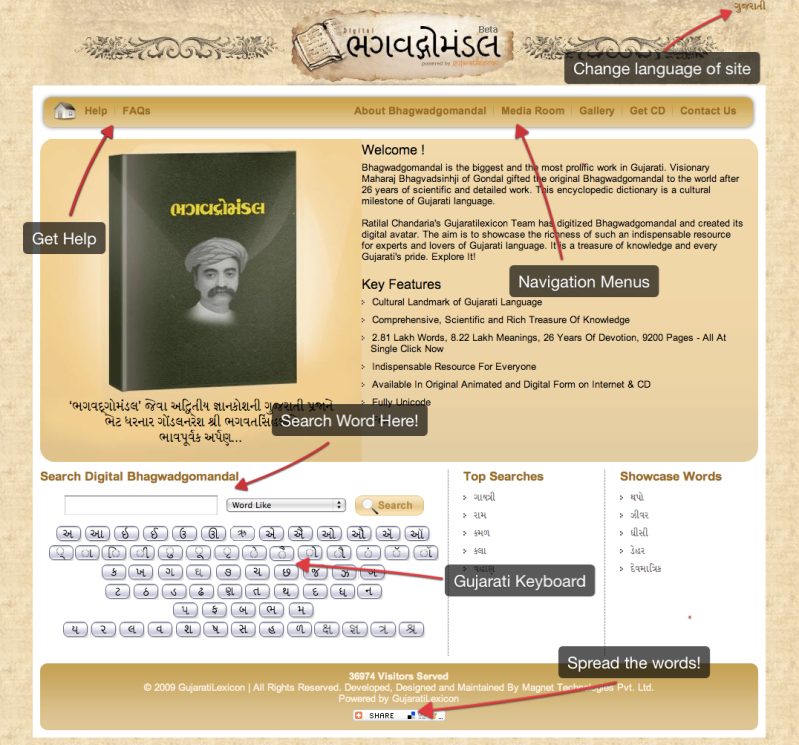 GujaratiLexicon is a landmark work in the history of Gujarati language containing resources of more than 25 lakh words. It aims to preserve, popularize and develop Gujarati language through the power of information technology. You can contact us by various ways! Best thing is to email us at info@gujaratilexicon.com for any queries regarding site or other details. View our Contact Us page for phone and our address.